Watlow plate flanged heaters are easy to install and maintain. These flanged heater products are designed for heating heat transfer fluids, medium and lightweight oils and water in tanks and pressure vessels. Plate flanged heaters are ideal for applications requiring low to medium wattage requirements. 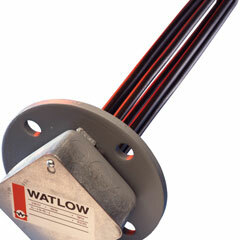 Watlow plate flanged heaters are made with WATROD tubular elements that are brazed or welded to the flange. Stock plate flanged heaters are supplied with general purpose or moisture-resistant terminal enclosures.